Rory McIlroy is poised to fire on all cylinders to get into position for a Masters challenge tomorrow. The four-time Major champion believes he has all the qualities he needs to drive himself up the leaderboard after rounds of 72 and 73 eased him into a group on one-over par. At the time he finished, the Northern Irishman was five adrift of early clubhouse joint leaders Charley Hoffman and Sergio Garcia, who had set the pace at four-under par. Late in the day, Belgium's Thomas Pieters and Rickie Fowler tacked on rounds of 68 and 67 respectively to bunch up alongside Hoffman and Garcia at the four-under mark. And in McIlroy's eyes, five shots is not an insurmountable gap. "If I can put together a 67 or a 66 tomorrow, I feel like I'll be right in there for Sunday. Even just being in position going into Sunday, I know more than most what can happen on Sundays around here, good and bad. "I've shot 66 in the last round and I've shot 80," McIlroy said. "It's just all about getting yourself in position, as you said, but I feel like I need something in the 60s tomorrow at least to get myself in there. "But I'm not disappointed, I'm disappointed by what happened at the last, but I'm in a decent position going into the weekend." The bogey five on the 18th arose when his ball rebounded off the flagstick. Instead of dropping to tap-in distance, it bounced away off the green and he took three to get down from there. Overall, the world No 2 was proud of his ability to hang in when the going got tough yesterday and on Thursday. "The middle part of the round yesterday was huge for me. It kept me going. There are still 36 more holes left to go - a long way in this tournament and I know what can happen, good and bad, around this golf course. "A couple of years ago over the weekend I shot ten-under par on the weekend and Jordan (Spieth) was just too far ahead. "There are other times I've shot bad weekends and went the other way. "Anything's possible out there but I feel like I'm playing well enough and I'm in a good frame of mind where I can go out there and attack and make some birdies," he said. Overnight leader Hoffman came back to the pack as he slumped from his first round 65 to 75, finishing on four-under par and taking the early clubhouse lead. He was later joined in that leadership role by Sergio Garcia. The magic touch Hoffman displayed in gaining a four-shot lead on Thursday disappeared between dusk and dawn, which was understandable since he got news that his grandmother died on Thursday. "It's tough to lose someone you've been close to but it was about going out there and playing a round to honour my grandmother," he said. 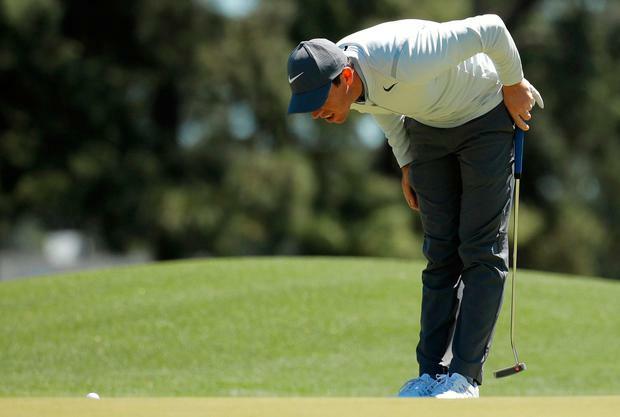 He shot ten strokes more than his stunning first-round effort but felt that on the day and in the circumstances, this was "just a solid round of golf." Hoffman has not given up hope that he can win, but tradition is against him. In the last 80 stagings of the Masters, the first round leader has gone on to win only 16 times. Garcia, meanwhile, has played 73 Majors without a victory, making him third in the list behind Jay Haas (87) and Lee Westwood (75). The Spaniard played alongside Shane Lowry and Lee Westwood, and if they had made a bet, he would have won it comfortably as Lowry shot 79 and Westwood carded 77. This is his 19th Masters appearance and Garcia had never previously registered three birdies in a row on those first three holes. "That helps, for sure and I got a couple nice breaks, so things are happening at the moment," he said. "I want to make sure that I keep riding that wave and go out there tomorrow, be positive, be like I've been the first two days. "Obviously there were a couple moments out there where I could have lost it a little bit. On 13, I hit a beautiful drive and a beautiful second shot straight over the flag and I made six. "You've just got to realise that those things are going to happen, and if you manage to do that, then you can come out here and compete and have a chance," Garcia added. Rickie Fowler has played 100 rounds in Major championships and never had a lead in any of them. He narrowly missed a chance of birdie on the 18th that would have given him outright leadership on five-under par, but a 67 and a share of the top place keeps Fowler right in the mix. "It's been good coming off a win at Honda and making a lot of birdies. It's going to be a fun weekend and we're going to see a lot of great golf," said Fowler. Jordan Spieth played the par-five 15th in regulation par yesterday, a four-shot improvement on his shocking nine at the same hole on Thursday. The mental scar tissue seemed to have healed, helped by a 69 for level-par overall. Spieth began his round ten shots off the lead, but is now only four behind. Phil Mickelson, 46, lost momentum on the second nine, but a 73 and level-par keeps his hopes alive,, while crowd favourite Fred Couples did not disappoint his fans. Couples, 57, playing in his 32nd Masters and 25 years after his 1992 victory, rolled back the years to shoot 70 for one-under par 143. He finished with a flourish, snatching a birdie three at the 18th. "I love this place and I always putt well here," said Couples.